A selection of part-time studies courses will be offered that will lead to an Associate Certificate in Computer Aided Design Technology. Computer Aided Design (CAD) tools are being increasingly used in engineering and architectural fields. As well, CAD is finding applications in other areas such as facilities management and interior design. The associate certificate program courses are taught at a level that assumes students have completed senior secondary school math, science and English or equivalent. 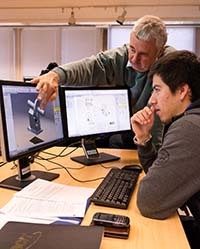 To be awarded an Associate Certificate in Computer Aided Design Technology, the student must complete 9.0 credits of required courses and 12.0 credits of elective courses for a total of 21.0 credits. To demonstrate their proficiency with CAD, students produce industry standard CAD drawings to the specifications of the industry sponsor. They also produce a report documenting the project. Students who have met the prerequisite should contact the BCIT CAD Training Centre to request a practicum information package for this self-directed course. Prerequisite: Completion of all other credits required for the Associate Certificate program in Computer Aided Design Technology. * Students may register for AICO 4090 (CAD Practicum) following completion of all other credits required for completion of the associate certificate. Designed for experienced AutoCAD users who would like to take advantage of AutoCAD's customization features to increase productivity and ease of use. Topics include configuration, modifying the ACAD.PGP file, accelerator keys, menu customization, command macros, sources of AutoCAD utilities, script files, slide libraries, custom linetypes, and basic DIESEL. Prerequisite: Familiarity with Microsoft Windows and AICO 2000. This course introduces the concepts and methods of 3D modeling using AutoCAD software. While wireframe, surface and solid modeling are covered, the emphasis is on creating and editing solid models. Solid models can be used for the virtual prototyping of parts and assemblies as well as architectural massing studies. Prerequisites: Familiarity with Microsoft Windows and AICO 2000. Covers sketching, part modeling, assemblies and design documentation. Autodesk Inventor uses adaptive technology to speed and simplify the mechanical design process. As a dedicated 3D mechanical computer aided design package, it is ideally suited for conceptual design. Prerequisite: MCAD experience and familiarity with Microsoft Windows. Covers part modeling, detailing and assembly design. SolidWorks is a feature based parametric solid modeler used for mechanical design and manufacturing. This course covers the basic functions needed to use SolidWorks to create parts, assemblies and production drawings. Prerequisite: MCAD experience and familiarity with Microsoft Windows. This course or equivalent knowledge is assumed for all other BCIT COMP courses in Computing Part-time Studies (PTS). Students focus on how a Personal Computer (PC) works and how to apply best practices to secure data and to manage files with Microsoft Window 10. Topics include: An introduction to PC hardware, functions of an operating system (OS), file and disk management, backing up and protecting data, troubleshooting, security, malware and firewalls. Windows 10 Power on self-test, BIOS settings, partitioning, the file system and formatting are also discussed. Hands-on exercises and labs include desktop navigation and using Windows 10 Admin to create user accounts and folder structures. Discussions also include the technical aspects of using Windows 10 in the set-up of a small PC network. There will be a brief comparison of Windows 10 to Windows 7, Linux and Macintosh OS. There are 6 week compressed delivery options for those students with some prior experience, otherwise the 12 week delivery is recommended due to the amount of homework. COMP 1002 is required for the Computer Systems Certificate (CSC), the Applied Computer Information Systems (ACIS), and the Applied Network Administration and Design (ANAD) Associate Certificates. Upon successful completion students will be able to use best practices in a Windows 10 networked environment. Prerequisites: BC Grade 12 English or equivalent. Note: Courses in Autodesk Civil 3D and Autodesk Revit presented by the BCIT School of Construction and the Environment can be considered for elective credit. Please email cad@bcit.ca for approval. Course credit may be applied for, but in no case can the total of applied credits exceed 10.0 credits. Substitution of credits can be made with departmental approval. All courses are subject to change. Additions and deletions to the listed courses reflect the continuing developments of CAD. Job opportunities depend on the student's chosen electives and previous level of education and applicable work experience. As a BCIT student and alumni, you have access to BCIT's Student Employment Services for work search support and resources, and also eJobs, an online job bank created specifically for BCIT graduates. Autodesk Authorized Training Centers® are recognized with awards based on their instructional performance on Autodesk products. BCIT's CAD Training Centre won the 2008 North American Award for Distinguished Performance in AutoCAD Software Training. This award is based on the collection of customer feedback through on-line evaluations. BCIT has been delivering quality instruction in Autodesk products like AutoCAD for over 20 years. Search AICO on the BCIT web for upcoming courses.